About 1 minute per MB, so 1 GB would be 1000 minutes. At 4 min per song: 1000 / 4 = 250 songs per GB. At 3 min per song: 1000 / 3 = 333 songs per GB. At 2 min per song: 1000 / 2 = 500 songs per GB. 2GB iPod / MP3 Player will hold approximately: 500 to 1,000 songs. 4GB iPod / MP3 Player will hold approximately: 1,000 to 2,000 songs. 8GB iPod / MP3 Player will hold approximately: 2,000 to 4,000 songs. 1. Photos with predominantly green colours tend to be larger than photos that are predominantly red or blue. I'm not sure why this is. 2. Colour photos, in general, tend to be larger than black and white photos, simply because there is more data to be stored for Colour. 3. Photos with more fine detail tend to be larger than photos with larger expanses of solid colour or texture. For example, a photo of a smooth, made up model's face would probably be significantly smaller than one showing the minute details of an elderly person's wrinkled face. Megapixel (MP) count refers to the maximum resolution of the camera's sensor -- its ability to record detail. In most of the newer cameras you can set the Resolution to something as low as 1.3 Mega Pixels and up. A pixel is a single picture element, and a megapixel is a million pixels. The following table is only a ruff guesstimate. Your results may, and probably will, vary because of the above stated details. 16GB and Higher values are left for your extrapolation skills …. speeds up to 300 MB/s. "Standard" SD cards max out at 2GB capacity, based on their classification and the controller used by SD-only devices. Most SD cards you'll find today are technically SDHC, with capacities between 4GB and 32GB. The largest class is SDXC, or Secure Digital Extended Capacity, can range from 64GB to 2TB. 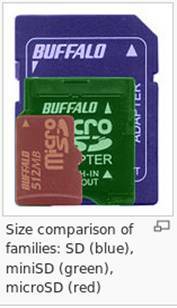 The micro form factor is the smallest SD card format.